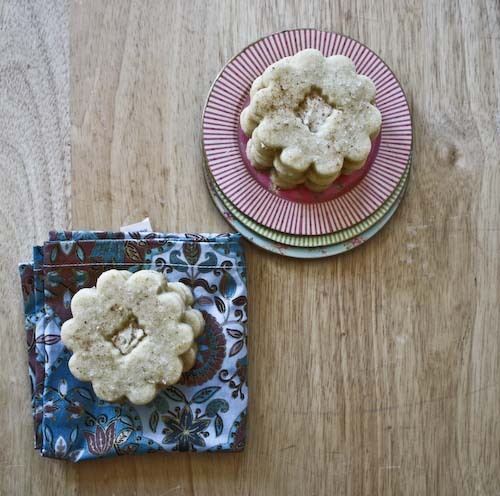 If there were a cookie for shortbread to aspire to, this would be it. One of the many things I love about shortbread is its unapologetic display of butter. Chocolate may get more ooohs and aaaahs, but shortbread is a stealthy challenger. Not so attention hungry, more calmly self-assured. Like a real vanilla ice cream, there is nothing boring about a truly great shortbread. Assuming, of course, that you like butter. I'll go ahead and assume. But even the perfect vanilla can benefit from a bit of toffee. And so, with this cookie, there's nutmeg and calvados to contend with. 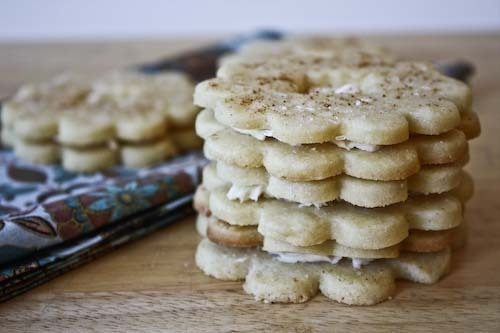 Any time you're going to cut, fill and sandwich cookies it's a bit of a fussy proposition, which, I must admit, belies the inherent simplicity of shortbread. But it's the holidays, and a little fuss is what the season is all about. In her book The Good Cookie, Tish Boyle envisioned these as just brandied, I added the apple part by using calvados instead of normal brandy. Use what you have or what you think you might like. Either way, eggnog has never been so proud. Affix the paddle attachment to an electric mixer and cream together the butter and sugar on medium speed until they're nicely combined, about 1 minute. Add the egg yolk, vanilla, nutmeg and salt and continue to mix until combined. Scrape down the sides and, at low speed, add the flour. Mix until combined. Scrape the dough onto a piece of plastic wrap, shape it into a rectangle and refrigerate for a least 1 hour and up to 3 days. Oven preheated to 350, wrack in center. Prepare two baking sheets by lining them with parchment paper. Roll the chilled dough out on a lightly floured surface until it's 1/8" thick. 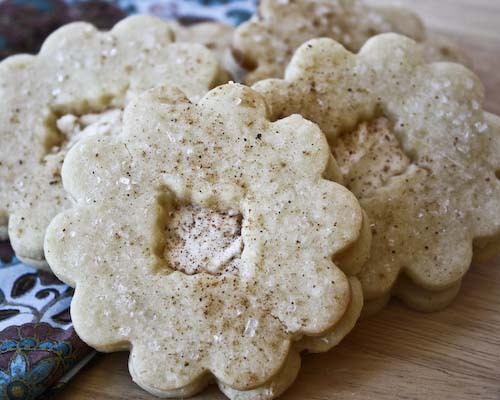 Using a cookie cutter, cut out your cookies. If you have an 1/2" aspic cutter, you can use that to cut out shapes in the middle of half of the cookies (these will be your tops). If you don't have an aspic cutter (as I didn't) you can use a pastry tip and if you don't have that, you can make something up. Re-roll any scraps, which may have to be refrigerated before they can be rolled. Transfer the cookies to the cookie sheets and sprinkle the tops with the coarse sugar. When you transfer the cookies, but the tops on one sheet and the bottoms on another, as the tops will take a minute or two less to cook. Bake your cookies one sheet at a time for 9-11 minutes, until lightly browned on the bottom, but not on the top. Transfer the cookies carefully to wracks to cool. Fix your electric mixer with the paddle attachment and beat the butter on medium until creamy, about 30 seconds. Gradually add the rest of the ingredients and beat until blended. Scrape down the sides of the bowl as necessary. Increase the speed to high and beat for 2 minutes more, until the filling is creamy. Once the cookies have cooled completely, place about 3/4 teaspoon of filling on each of the bottoms. Press a top cookie into the filling, making sure they're right side up (the side with the sugar). Sprinkle a bit of nutmeg over the tops and enjoy. You can save these cookies at room temperature for about 3 days, or in the refrigerator for about 1 week. These look yummy! (Lol to Chrissy - I wanna see that!) I haven't tried eggnog, but keep meaning to. Hoping you have a happy and yummy Christmas day! looks delicious Andrea. i have the same book so i have to try it in the future. happy holidays to you! 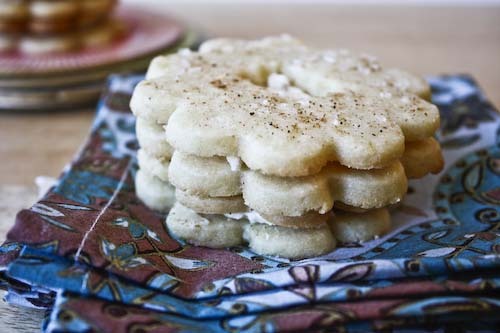 I've seen a few eggnog recipes, but never one for apple brandied eggnog cookies. They sound perfect! Chrissy, you are a chubby bunny! Annie, I've never really had real eggnog either, just the boxed pre-made kind. Maybe I'll put that at the top of the list for next year. Eliza, thanks! This is the first thing I've made from this book, but I'll definitely come back to it. Megan, what a lovely tradition. I'm a sucker for shortbread! Sophie, thanks! It was a unique little cookie.